CollegeMobile is proud to announce the launch of Affinity Mobile, the official mobile banking app for Affinity Credit Union members. It was developed to provide clients with convenient access to their bank anywhere in the world. Affinity Mobile gives clients the ability to locate an Affinity Branch or ATM, find hours of operation, view contact info, transfer money, pay bills, and much more. Affinity Mobile is now available on iPhone, Android, and BlackBerry, and will soon be our first published Windows Phone 7 app! 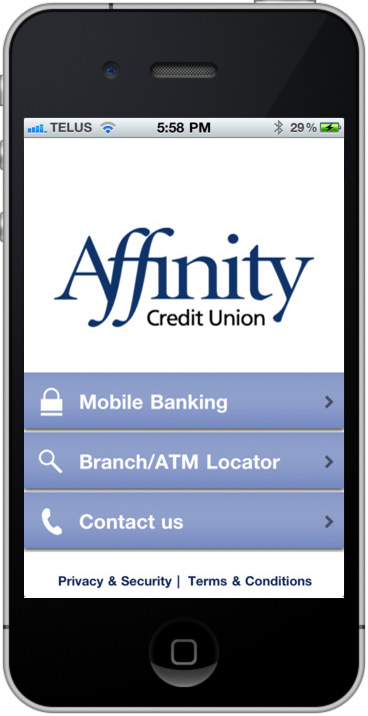 Time is money, so speed up your banking with the Affinity Mobile app.